Now that school is out, we have some extra time during our meals. Less rushing = more time for fun! Right now my boys are really into playing games, especially Bingo - and they also love Disney/Pixar’s Finding Dory! If you ask me, this calls for some happy dancing in the kitchen! I've created some simple ways to help make mealtime more fun! Just keep swimming and you'll see how! I remember eating Campbell's soup as a child. Sipping, spelling, and slurping up the chicken broth. 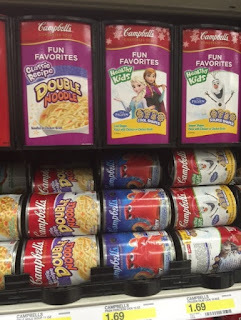 My kids enjoy all the fun shaped pasta options that are offered - especially all the Disney themed varieties! I find comfort in knowing there isn't any MSG added. 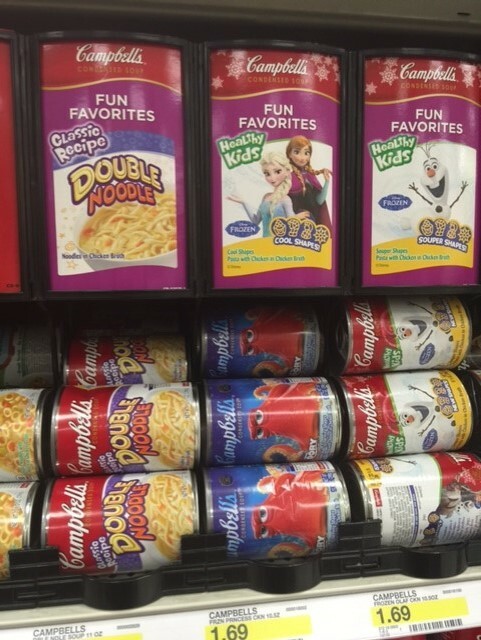 I was so giddy when I found specially marked cans of Campbell's Soup featuring Disney/Pixar's Finding Dory, in my local Target store! 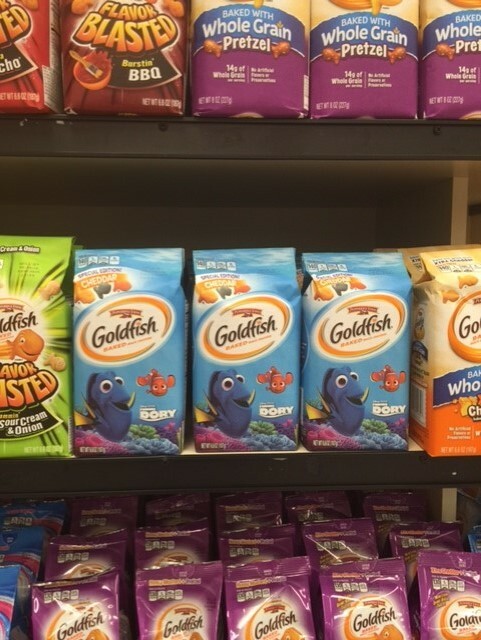 You can find cans with Dory, Nemo, and Hank. 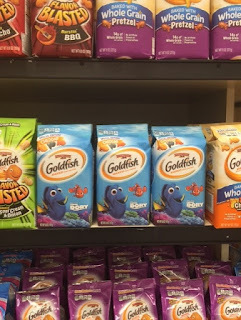 I also discovered Goldfish® Special Edition! Cheddar Disney Pixar’s Finding Dory Crackers! I felt like it was my lucky day! Because I love to celebrate just about anything & everything, I planned on adding some fun to my boys' next meal! I served their soup in mini plastic fish bowls - even though obviously the food is for humans and not actual fish. How fun is that?! I set the bowls out on a printable placemat I created, and set out Disney/Pixar’s Finding Dory themed utensils, and plastic cups that I purchased from Target. While my boys were eating, I gave each of them a printable Bingo card. In each can of Campbell's Soup featuring Disney/Pixar's Finding Dory you'll find pasta shaped characters. The object of the game is to get BINGO by placing Goldfish® crackers on the coordinating pictures of the noodles that are scooped out of the bowl! This is a time where I don't mind my boys playing with their food! I've created some free downloads to help make your mealtime with Campbell's Soup featuring Disney/Pixar's Finding Dory, and Goldfish® Special Edition! Cheddar Disney Pixar’s Finding Dory Crackers more fun & interactive! You can print them out here. Ready to make your mealtime more fun? Click here to save 20% off of your next purchase of Goldfish® Special Edition! Cheddar Disney Pixar’s Finding Dory Crackers. But wait! If you click here, you can also save 10% off of your next can of Healthy Kids Campbell's Soup featuring Disney/Pixar's Finding Dory! How will you make mealtimes more fun?! Here's our pin to save to your favorite Finding Dory board - just keep swimming! Thank you, Summer! My boys really enjoyed them.